The Kentucky Reading Project (KRP) is a professional development initiative of the Collaborative Center for Literacy Development. The yearlong, graduate level literacy course consists of a two-week intensive summer institute, four follow-up sessions during the year, and at least one coaching visit to each teacher. The eight state universities serve as sites for KRP, and university literacy faculty serve as directors of KRP. 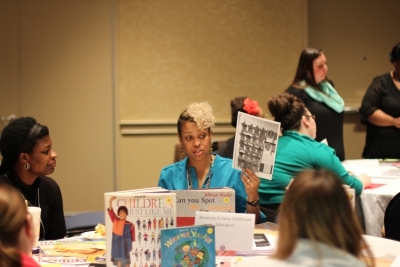 Training specialists from the National Center for Families Learning provide information, resources, and support regarding family engagement in literacy. During KRP, teachers learn best practices in literacy instruction while participating in a professional learning community that positions them for leadership roles in their school, district and the state. They increase their effectiveness as teachers by expanding their knowledge base and deepening their understanding of best practices in literacy instruction as they develop and implement a Literacy Action Plan in their classrooms. The mission of Kentucky Reading Project (KRP) is to increase student achievement and family engagement in literacy by empowering P-5 teachers to design and implement comprehensive, research-based instruction driven by the on-going assessment of diverse learners’ needs. 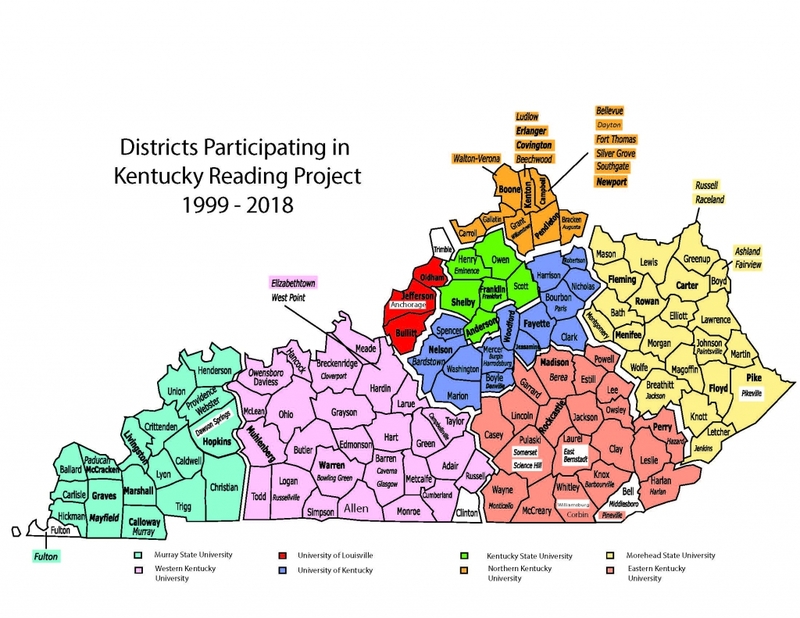 In the nearly 20 years since the inception of the Kentucky Reading Project (KRP), this statewide literacy professional development program has had a far-reaching and profound impact. The learning is rigorous and relevant; it is also ongoing through follow-up sessions and coaching visits. The numbers below highlighting the impact of KRP are impressive, but even more so is the powerful, positive impact KRP has had on students’ reading instruction and achievement (see graph). KRP has trained 3,833 teachers in 595 schools in 160 districts, serving approximately 1,000,000 students (2017-2018, based on estimated class-size of 23). 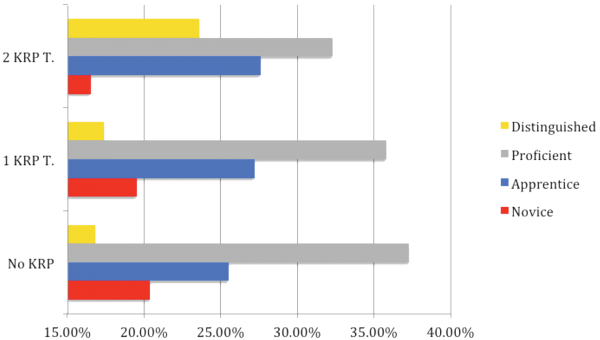 One teacher (T) in six years decreases likelihood of Novice (red) ranking and increases the likelihood of Distinguished (yellow) ranking. Two or more teachers in six years increased this effect. Drop in Proficient ranking demonstrates that students who would be at this ranking otherwise were assisted into the Distinguished ranking, while increases in Apprentice ranking shows students who would be at Novice otherwise were moved to Apprentice. She is assisted by Debbie Carter, former teacher and literacy consultant, and Andrea Marcum, music teacher at Arlington Elementary in Fayette County. The Kentucky Reading Project (KRP) is a high-intensity and extended-duration elementary literacy instruction professional development program provided by the literacy faculty at Kentucky’s 8 state universities, and administered by the Collaborative Center for Literacy Development (CCLD) at the University of Kentucky. The program is free to teachers, free to schools, and free to districts, paid for by lottery monies and state appropriations. KRP has been in operation since 1998, and provides teachers with graduate course credit-worthy instructional improvement. Although the precise structure of the KRP process will vary slightly between the eight state university service regions, it typically involves a full-day, two-week summer intensive to provide teachers with evidence-based best practices, quality tools and materials, and instructional problem solving skills. During the intensive, teachers work together to design classroom implementations for their students’ most pressing literacy needs. They utilize these implementations (lesson unit plans, formative assessment designs, skill development materials, etc.) in their classrooms throughout the following academic year, with faculty observation and peer support to guide teachers through implementation and assessment. The yearlong study culminates with a presentation of teachers’ results and planned next steps at a statewide Spring Share Fair. KRP has been immensely popular and demonstrably successful at improving students’ literacy achievement (visit the KRP webpage at www.kentuckyliteracy.org for research reports on KRP’s impact). 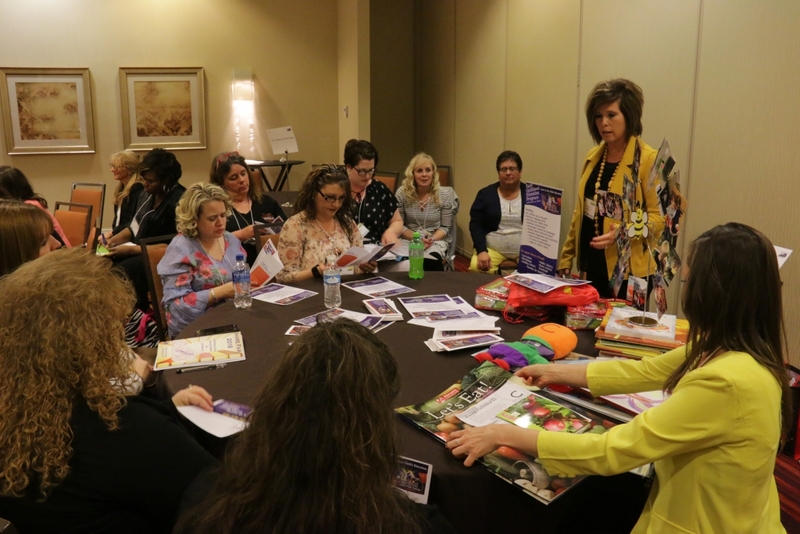 For that reason, the Kentucky Department of Education has chosen to include KRP training to fulfil the requirement for the literacy training for the Read to Achieve (RTA) +1 classroom teachers. CCLD will be happy to provide more information about the value and impact of KRP to interested teachers and principals. For more info, please see the FAQs (below) or contact KRP Program Director Cary Pappas (cary.pappas@uky.edu) or 859-257-6118. Do I need to apply for the KRP4RTA literacy training? In this special form of “KRP4RTA,” school principals recommend teachers for acceptance into the KRP cohort, instead of admission through a competitive application process like KRP. 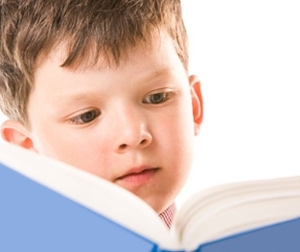 Do I need to register for Literacy Training for the RTA +1 Classroom Teacher? If you are the RTA +1 teacher at your school, you need to go to this link: https://kentuckyliteracy.org/2019-2020-read-to-achieve-plus1-teacher-registration/ and register so we have your information in our database. If you have chosen an alternative literacy training other than the KRP4RTA, you still need to register and indicate that you are participating in alternative training. Whitney Hamilton will need to approve the alternate training and will be in contact with you. Will I receive graduate credit for the KRP4RTA? In accordance with the requirements set forth by the KDE, KRP4RTA will not offer graduate course credit to teachers. If a teacher wants to take the course for graduate credit, they may pay the tuition themselves or the school or district can pay the tuition. How many hours is the summer intensive training? The minimum number of hours for the KRP4RTA training is 40 hours, including two follow-ups during the school year, one of which is the Share Fair in April 2020. The summer intensive training will be a minimum of 30 hours. The site directors have the discretion to schedule additional time for the training if they feel it is necessary to cover all the material and meet the needs of the participants in their service region. Will there be follow-up meetings? Two follow-up meetings are required as part of the literacy training, one in the fall and one in the winter at eight centrally located facilities. The specific dates will be decided upon by the directors and the teachers in each of the eight cohorts. 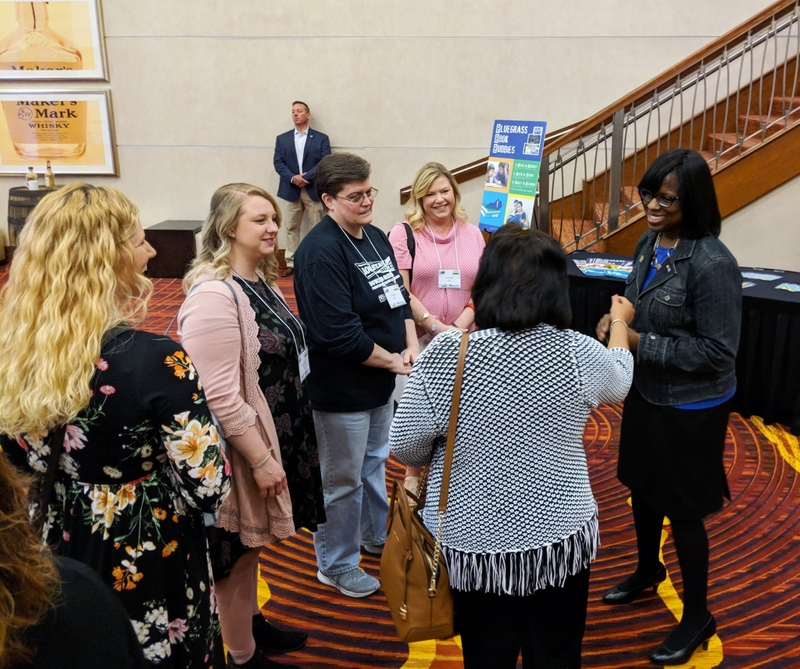 Teachers will also be required to attend the CCLD Literacy Share Fair, which will take place on Saturday, April 18, 2020 in Louisville. Where will the KRP4RTA summer intensives take place? The summer intensives will take place at a centrally located location given the distribution of enrollments for that university service region. Each teacher participating in the KRP4RTA will be assigned to a university site, based on geographic and equitable distribution of teachers. These university sites will be posted on the CCLD website (www.kentuckyliteracy.org) early in the spring so teachers will know to which university site they have been assigned. When will KRP4RTA take place? Will I receive books and materials for the KRP4RTA literacy training? Participating teachers will receive books and materials worth approximately $150 for the KRP4RTA literacy training. Will I receive a stipend for participating in the KRP4RTA? Participating teachers will receive a stipend of $250 to cover incidental costs. Teachers will receive the stipend after the CCLD Literacy Share Fair in April 2020, the culmination of the yearlong literacy training. Will I receive a certificate of completion when I complete the KRP4RTA? You will receive a certificate of completion at the end of the yearlong KRP4RTA, provided you have met all the requirements of the RTA grant. However, it will be up to the school or district to decide if and how many hours will go toward PD credit.